Today I went to the mall and picked up three new items. I know I like to read blogs that highlight great deals AND how they fit, so I couldn't keep these finds to myself! Let me just say this: I hardly everrrrr buy things for myself at full price. EVER. 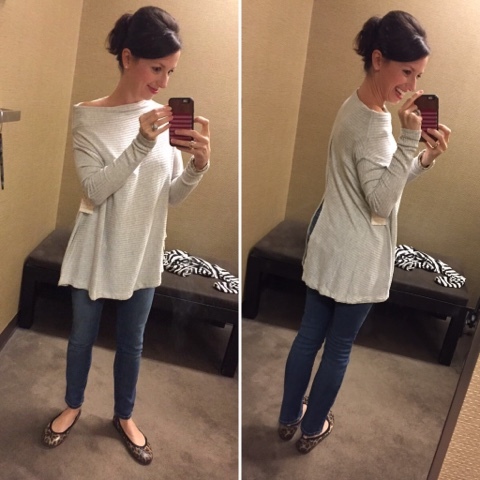 But I tried on this shirt (which is insanely comfy), loved the stretchiness and heft of the fabric, loved the cut, loved that it could be worn a few ways, and loved the open back, and ... crazy moment, very unlike me ... I told the associate that I would love to order it in two colors. It's perfect for my residual baby pooch (yep, six months in, ha!) yet still looks tailored. I ordered the black and blush colors; blush is sold out online but they found one my size in the Austin TX store. The gray that I tried on is awesome, and I love the teal and rust colors they have too -- I just wear a lot of black and blush pink. Sizing-wise, I ordered the XS. I'm 5'2" so I felt like the length of the XS was perfect. But I think this top is cut in a way that would allow you to go up or down a size and not really notice. 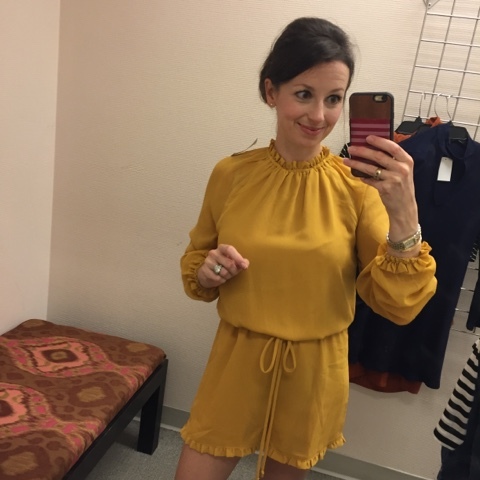 The woman in the dressing room beside me saw me wearing this, and she immediately wanted one too -- she is normally a medium but all they had in the rust color in the store was a large -- she tried it on and it fit her perfectly! 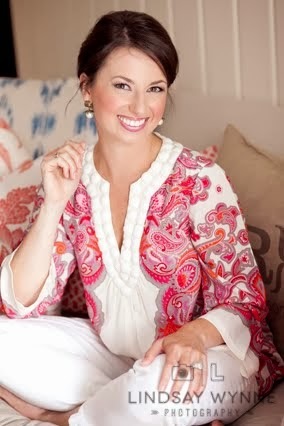 I originally spotted this top on McKenna Bleu and took a screenshot of her post (below) and showed it to the Nordstrom associate so she could help me locate the top! My black and blush tops should be in end of this week or beginning of next week and I cannot WAIT to wear them this season. Before I left Nordstrom, I popped over to the junior's area because you can often find quality outfits there at a lower pricepoint. I bought this gold romper (which is currently 40% off for $41 HERE) and will either wear it out to dinner with Ian soon or to an upcoming event we have on our November calendar. I also went with the XS for this, for sizing reference. The sleeves are slightly sheer and I just love that ruffled neckline. And for $41, what a deal! That romper looks adorable on you and I love the new sweaters. The cut is so nice! The top is great (I am now about to order it in black) but you are absolutely slaying it in that gold romper. Oh that top is so cute!! Both items look great on you!! you are so cute!!! i love that top!! and yessss when you find something perfect i am all about multiples!!! I love that open back shirt. I would wear a tank too. Sometimes I would do the bra, but not often. I ordered the sweater in two colors too.. eek! I have so much blush I'm trying to branch out! So I got grey and black!